Join Us This Sunday LIVE! We’re thrilled to announce our first show of the year…and it’s going to be a wild one! 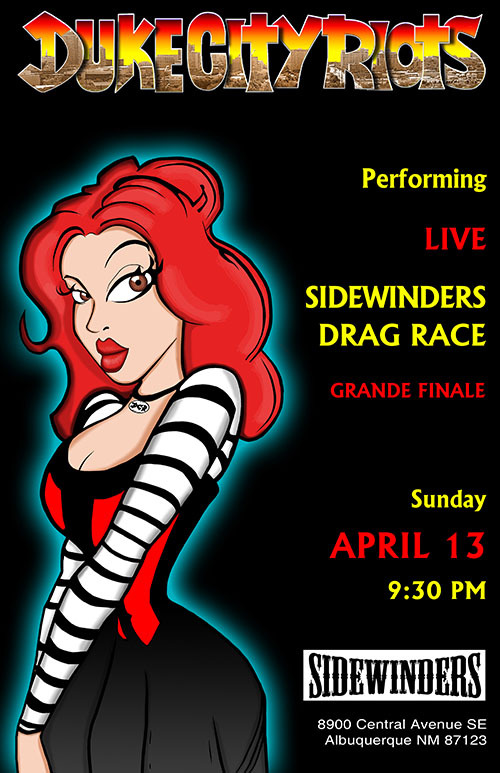 We’ve been invited to be the musical entertainment for the grand finale of Sidewinder’s Drag Race… this Sunday, April 13 at 9:30 p.m. The event is the culmination of a six week competition, and it is modeled after the popular TV show RuPaul’s Drag Race. The competition begins this Sunday…more details at the bottom of this post. We’ll be joined by some surprise special guests, and we’ll be playing some brand new songs for the very first time. We hope you’ll be with us for a most unique evening…we’re honored to be the first live band to ever play at Sidewinder’s, so come join us for a walk on the wild side!! Its Here!!! ” Sidewinders Drag Race” ! invite your friends! 6 shows at Sidewinders Bar- MARCH 9TH THRU APRIL 13TH! Local & out of town guest performers! Performances By Burlesque Noir!. Albuquerque Civic Chorus,Albuquerque’s Own Duke City Riots! Doutelle DeVarga!from Santa Fe! and many more amazing acts!Plus !COMPETITION! ONLINE VOTING! BEER BLAST! AND ITS A FREE SHOW!!!!!!!! !